Maureen Sebastian and David DeSantos in the Arena Stage production of The Arabian Nights. Photo by Stan Barouh. There are two types of perfume. One kind hits with a ravishing force. You recognize the top notes instantly, as they drag you down an olfactory lane whether you want to or not. The other kind is subtly layered, ingratiating itself into your memory with a more delicate air. I expected Mary Zimmerman’s adaptation of The Arabian Nights to be a powerful whiff of rose attar or sandalwood, instead, it’s more elusive, like night jasmine on the breeze. Meandering metaphor? Well, yes, and that seems to be the play’s point. After almost three hours of stories intertwined with stories, you might feel like you are on the hunt for that beautiful scent. This isn’t a play intending to make a political statement about our continuing entanglement with the Middle East, or even a social statement about women’s rights. I may have wished for those things, and felt sorely disappointed when I didn’t get them, but perhaps that desire for “relevance” was misguided. I didn’t fully appreciate the production’s intention until a few days after seeing it, when an image of rolling bodies in white like ghostly sheaves of paper in the wind re-entered my mind. The best way to approach The Arabian Nights, performed in the round at the Fichandler in Arena Stage’s Mead Center for American Theater, is to just drop any expectations and let the perfume take you where it will. It’s a drifting play, born of improvisation, about the healing power of myth as a mad king is shown the slow road to salvation. But it’s not all perfumed nights and sensuality. There’s some castration. Oh, and a lot of farting. Members of the cast in the Arena Stage production of The Arabian Nights. Photo by Stan Barouh. The Arabian Nights was first staged back in 1992 at the Lookingglass Theatre Company in Chicago, as director and adapter Mary Zimmerman wove a narrative out of the beloved Persian folk tales that we know as The Book of the Thousand Nights and One Night. The current production at Arena is in association with Lookingglass, the Berkeley Repertory Theatre and the Kansas Repertory Theatre. Though there is an official script now, the improvisation that was used to create the piece still is encouraged and adds to a certain fun chaos. For me the first half took some getting used to – you can easily get lost in the multi-layered stories as you search for a point. At the start of the play, the king Shahryar murders his wife upon discovering her infidelity. Every night he takes a new virgin bride, and murders her at dawn. His newest wife, Scheherezade, is determined to escape that fate and seduces the king with her storytelling. The action of the first half – frenetic stories weaving back and forward upon themselves – represents her frantic attempts to find the motif that will save her. At first she plays to his insecurities, with typical fables of female betrayal, but slowly the theme of redemption begins to emerge. By focusing on a double for Shahryar, the noble Harun al-Rashid, she aims to prove to him that he can be a great king again. It’s an interesting conceit to have the action mirror the intention, but honestly that first half didn’t move me as much as the second half, where things get more melancholic and yet closer to salvation. Two sequences in particular hit me with the emotional force I longed for throughout. In one, the mythical Harun al-Rashid meets his doppelganger Aziz, and hears his story of love lost through careless lust. In that way Shahryar meets himself (the brooding David DeSantos even plays both Aziz and Shahryar), and it’s sweet, sad and horrifying all at once. In the other, Harun meets Scheherezade’s mirror, the wise girl Sympathy the Learned (a calmly radiant Susaan Jamshidi) who outwits all his counselors through her incredible knowledge but also her gentle tenacity. Evan Zes and Maureen Sebastian in the Arena Stage production of The Arabian Nights. Photo by Stan Barouh. It isn’t all melancholy, however, and the audience loved the story of the extremely serious man undone by one hell of a long fart (I really felt this went on too long, but, I get it, sometimes you need a release). The ensemble actors are all incredibly committed to a very athletic production, notably Usman Ally and Nicole Shahloub in a number of roles. As Scheherezade, Stacey Yen is almost never at rest – watch as she acts out all the roles while the stories progress, yet also checks in constantly to see their effect on the king. Maureen Sebastian frolics about stage as her sister and others, only to end up in the most affecting moment as the scorned Aziza (I dare you not to cry at the repeated canon, “Why did you leave me? All alone.”). It may feel initially like a pastiche, too light-hearted and frantic to really dig deep into the potent themes of betrayal and isolation. That was my first reaction. But I’ve found myself returning unbidden to certain images – the seductive dance of women in black burqas, the swinging of a lamp like a pendulum between lovers, the sad smile of a storyteller. It’s stayed with me, the idea that words have the power to heal, to wound, to raise an empire or destroy it, as Sympathy the Learned teaches Harun al-Rashid. This might just be one of those performances that’s so multi-layered at first it seems too light, but on further investigation unveils its true notes and stays with you for a longer time. Like those two perfumes. Like the king insisting that Scheherezade tell one more tale, just to be sure of her. I might have to see it again. 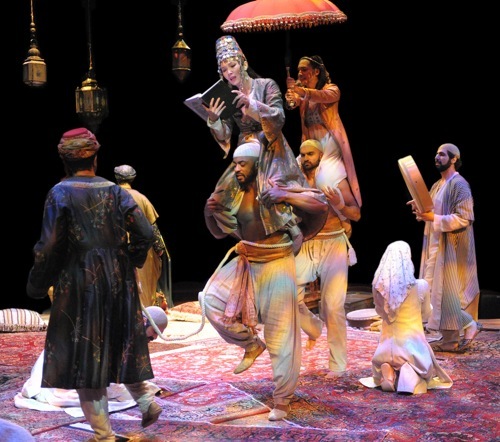 The Arabian Nights plays through February 20, at Arena Stage at the Mead Center for American Theater located at 1101 6th Street SW, Washington DC 20024. Closest Metro stop: Waterfront-SEU (Green lines). For more information call 202.488.3300.